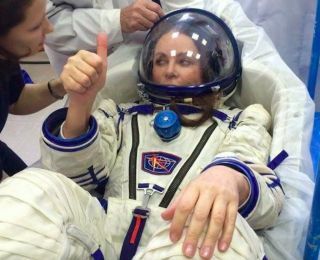 Singer Sarah Brightman trains in a Russian Sokol pressure suit for a future mission to the International Space Station. Famed soprano Sarah Brightman will not become the first professional singer in space this September. Roscosmos is Russia's federal space agency, Energia is a Russian spacecraft manufacturer and Star City is the site outside Moscow where GCTC is located. Brightman brokered her trip aboard the three-person Soyuz — whose other manifested passengers for the Sept. 1 flight are cosmonaut Sergey Volkov and European astronaut Andreas Mogensen — via the Virginia-based company Space Adventures. "Since 2012, Sarah has shared her story of a lifelong dream to fly to space. Her international fame as the world’s best-selling soprano has enabled her message to circle the globe, inspiring others to pursue their own dreams," Eric Anderson, Space Adventures' co-founder and chairman, said today in a statement accompanying Brightman's announcement. "We've seen firsthand her dedication to every aspect of her spaceflight training, and to date, [she] has passed all of her training and medical tests," Anderson added. "We applaud her determination, and we'll continue to support her as she pursues a future spaceflight opportunity." A handful of private citizens have journeyed to the International Space Station aboard a Soyuz on their own dime. American businessman Dennis Tito was the first, plunking down a reported $20 million for his 2001 mission. Six other private citizens then flew to the space station a total of seven times between 2002 and 2009. (Software executive Charles Simonyi went twice.) The last space tourist to live aboard the orbiting lab was Canadian Guy Laliberte, founder of Cirque du Soleil. He reportedly paid about $35 million for his 2009 flight.